Drummond’s ‘Duke of Wellington’. ‘A good orange dahlia was much required, and this is one; it has a fine centre and outline, is of medium size, and the colour is bright. Nothing yet produced in this class comes near it.’ [FC p.10/1849]. ‘Duke of Wellington’ was a firm exhibition favourite from the late 1840s onwards. Described as an orange-scarlet self, it was considered to be one of the best dahlias sent out in the years 1848-50. It was among the prize takers at the great exhibition of dahlias held in Edinburgh in 1855, and still among the prize winners at the Grand National Dahlia Show in September 1858. [Gard. Chron. 1858]. Possibly illustrated in the British Florist although the flower shown does not conform to the descriptions given here, being a ball type flower of deep red, almost maroon. [BF pl.40/1843]. It is quite likely that more than one flower was given the name ‘Duke of Wellington’ although I have only found descriptions of Drummond’s plant. 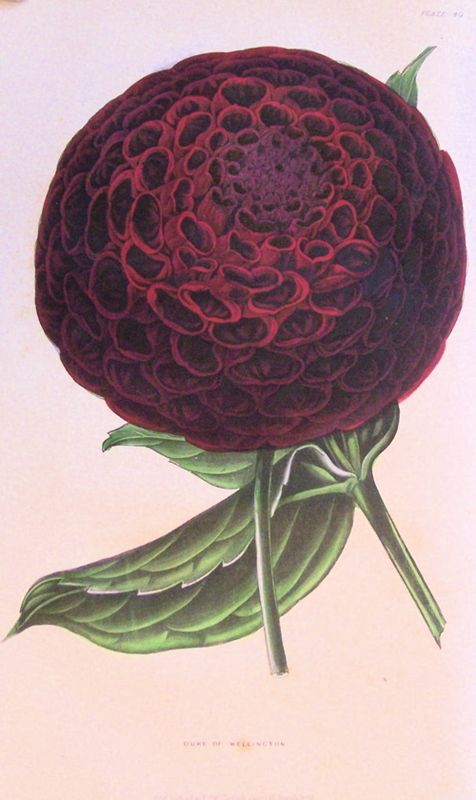 Few coloured illustrations of dahlias survive from this time. Listed in Addenda to the 1857 catalogue [A.28/1857].